What do you get when you combine a pair of seersucker shorts and the J. Crew Punk Floral top together? Sucker punked! I first ordered these Bermuda seersucker shorts from the J. Crew Factory a couple months back on final sale. Little did I know that they would be the perfect compliment to the silk swoop top in punk floral. Sadly this top is now sold out on line, yet I was lucky enough to "swoop" in and get it during the 25% off your total purchase sale promo a few weeks ago. I like the fit and feel of the top and the unique detail of the opening in the back. For reference I took a size 2 (I'm usually a 0 or 2) in this particular style and found the fit to be just right. I'm not sure exactly why the print is called punk floral. It doesn't quite look like something that any self respecting punk rocker would wear. To me the print is more Warhol-esque and reminiscent of the 1960s. 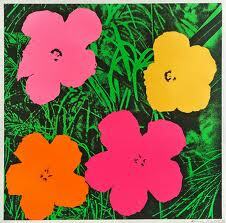 Below I've featured some of Warhol's flowers for reference. Regardless of the style and the era, this is sure to become one of my favorite blouse for spring and summer. I love the back of this top. I definitely got punked thinking the back would be like any ordinary top! ;) Nice score! Thank you! I think the back is also my favorite detail. oh the back is just gorgeous! such a great outfit, katie!